Dining rooms can be surprisingly tricky when it comes to choosing flooring. Many people opt for a tile or wood floor with an area rug beneath the table. That's a great option but we also encourage people to consider carpet. Carpet in the dining room? Yes! Wall-to-wall carpet adds a touch of luxury and comfort to a dining room that isn't matched by any other flooring choice. Carpet comes in so many styles that you're sure to find just the right balance between design and practicality for your dining room. The dining room is often a room that isn't used daily. That makes it the perfect choice for a carpet style that might not be practical in a room that sees heavy foot traffic. 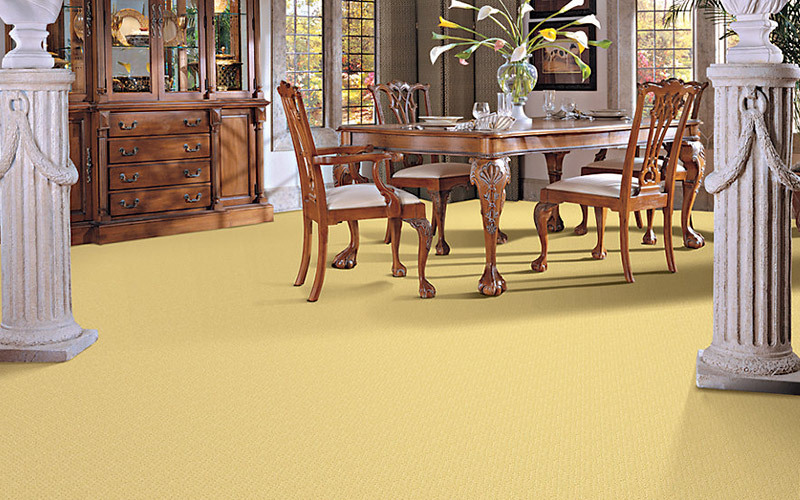 Deep plush carpets are a wonderful choice for a formal dining room. Formal or casual, the dining room is also a place where you can be more creative with color. Deep, dark greens. Bright whites. Bold reds. All of these can make a dining room stand out and let you express your individual style. In an open floor plan you might want to choose a complimentary color to the neighboring rooms - perhaps a red to compliment the greens and browns of your living room. If you dining room is separated from the rest of the house, the sky is the limit! Patterned carpets are very popular right now in any room of the house. The dining room is no exception. In fact, the dining room can be a great place to explore a statement pattern such as an animal print. It can also be the perfect opportunity to introduce a subtle pattern that you can carry through other rooms in the house. While we're talking patterns, we should also mention layers. 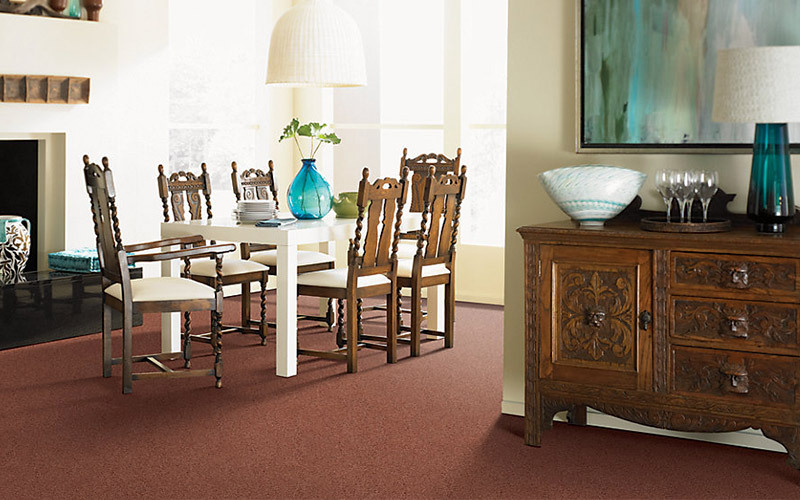 Pick a patterned carpet and a solid area rug - or vice versa - to add a distinct, trendy style to your dining room. Area rugs aren't just for hard floors, they make beautiful statement pieces on carpets too! The primary reason people don't consider carpet for the dining room? Concerns about spills and stains. With proper maintenance and quick stain removal, you can keep the carpet in your dining room looking like new for years to come. Check out Kermans free carpet care guide for maintenance and spot removal tips. Indianapolis carpet store, Kermans, has designers on staff ready to help inspire you or make your vision a reality. Schedule a free consultation and let us know ahead of time what you're considering. We'll have some samples laid out and ready when you arrive.